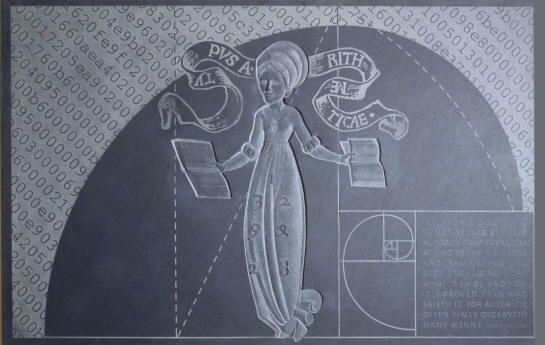 This wall piece, measuring 4 x 6 ft, celebrates the work and the life of Robert Recorde born in Tenby, Wales about 1512 and who was the writer of the first series of mathematics texts in the English language. This piece of work arises out of the belief that fundamental proportional systems are common to both the sciences and the visual arts. In addition, the depiction of ‘equivalents’ are key elements in its design. The book, The Whetstone of Witte, by Recorde published in 1557, about algebra was the first book ever to use the ‘=’ sign to denote equality. As Recorde put it ‘to avoide the tedious repetition of these woordes: is equalle to: I will sette as I doe often in woorke use, a paire of paralleles, or Gemowe [twin, as in gemini] lines of one lengthe, thus: =, bicause noe 2 thynges, can be moare equalle.’ With the help of this innovation he was able to express equations in purely symbolic form. The design of the work was a collaboration with the Computer Science Department. The central figure of Arithmetic has been processed via the computer and displayed in the background as an equivalent image in a series of letters and numbers. The quotation in the bottom right hand corner by Recorde explicitly demonstrates his consideration given to the problems of learning and teaching.